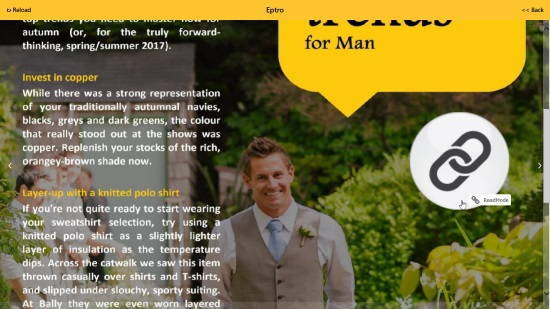 Eptro is a free news app for Windows 8 and 8.1 computers which keeps you updated with the daily news articles. 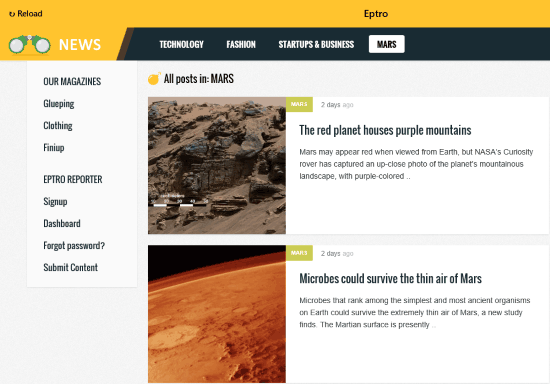 The app provides news in four categories, namely Technology, Fashion, Startups and Business, and Mars. Clicking on a particular section, you will read the news articles related to that section. All the news articles in the app are kept short and informative so that you will get almost all the information about that particular topic in less time. Moreover, you can share every news article on the social media like Twitter, Facebook, Pinterest, and Google+. You can also create a free account on Eptro. If you have an interest in Astronomy and would like to read the news articles related to astronomy, this news app for Windows 8 will be a pretty good option for you, as it provides the latest news about the Mars planet. This free news app for Windows 8 is easy to get. A link is provided at the end of the article, just click on the link and you will be redirected to the download page of the app for installation. At the installation page, click on the Install button and Windows will install the app on your system automatically. You can also download this news app directly from the Microsoft Store searching it by its name. Let’s have a look at some of the features of this free news app. 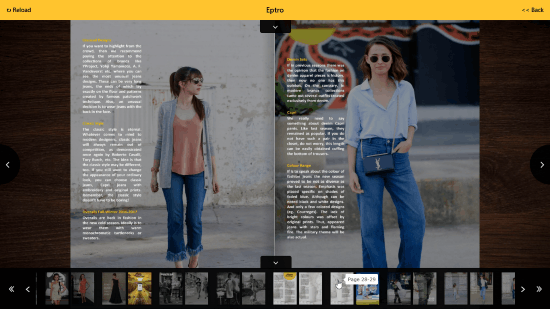 The app comes with a collection of magazines. A sharing option is available in every magazine. You can share it on Facebook, Google+, and Twitter. If you want to share it with your friends via email, that option is also available in the app. You can open any page of the magazine randomly simply from the list displayed at the bottom of the magazine. This can also be done by clicking the thumbnails option in the magazine. If you want to read more about a particular topic in the magazine, click read more option. This will opens a PDF file in the browser where you can read the full article. Click anywhere in the magazine to zoom in or out. This is a lightweight news app for windows 8 which is completely free. Here you can read the latest news articles in less time and get updated. All in all, this is one of the great apps for reading news articles in less time. Download Eptro for Windows 8.